David Weber, who’s lived in the neighborhood since 1997, presented a figurine he said reminded him of a kid in a costume and the memory of taking his son to Bloomfield’s annual Halloween parade. Responding to a prompt at a January community meeting, participants used the trinkets to reminisce and mark the most memorable components of the neighborhood. The exercise was the first step in a hands-on process to give residents a say in what happens to one of Bloomfield's most important properties, the ShurSave IGA. 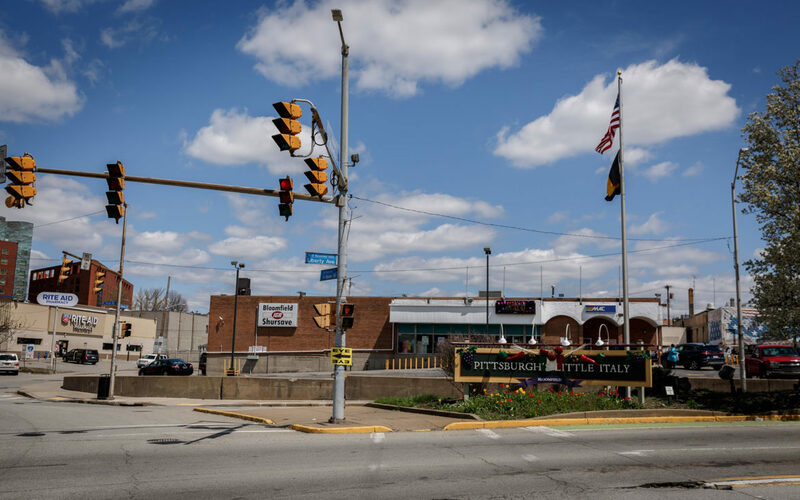 For more than 35 years, Bloomfield residents have bought groceries at the store at the intersection of Liberty Avenue and the Bloomfield Bridge — an area known as the gateway to the Bloomfield. Now the property is being eyed for private redevelopment, and residents are hoping to present ideas to preserve Bloomfield’s character as a diverse and affordable neighborhood. 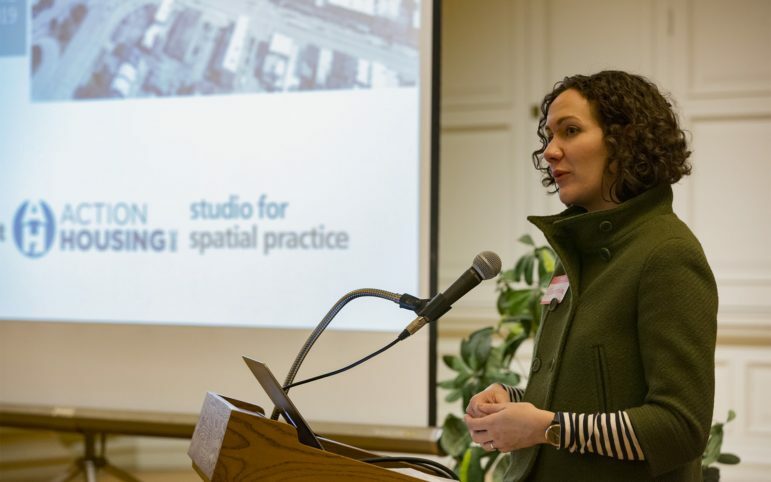 Bloomfield Development Corp., along with the affordable housing nonprofit ACTION-Housing and the Lawrenceville-based design firm Studio for Spatial Practice [SFSP], convened pairs of workshops in January and February to create a formal set of community recommendations for the site. The results will be presented at a public meeting from 4 to 7 p.m. on April 10 at West Penn Hospital. Nearby communities like Lawrenceville and East Liberty have seen rapid redevelopment in recent years. Linda Metropulos, vice president of real estate at ACTION-Housing, said those communities have also seen a decrease in economic, racial and cultural diversity. Christina Howell, executive director of the Bloomfield Development Corp., said she hopes Bloomfield will preserve its diversity through the change. Through the trinket activity, participants focused on what they value most about the neighborhood. Common threads included pedestrian safety, accessibility for the elderly and residents with disabilities, income diversity and increased green spaces. At the second workshop in February, residents zeroed in on the ShurSave site. There, they hope to see affordable, multi-generational housing as well as senior-exclusive apartments. The participants also didn’t want to lose a community grocery store altogether and hope a medium-sized market will be included in any future redevelopment. Howell told participants at the Feb. 23 meeting that a buyer had been identified for the site, though she did not know their identity or details on a potential development plan. “Typically a developer of a project of this size...would have reached out to the community by now, or would have made themselves known,” Howell said in a Feb. 26 interview. Mark Davis, the site’s longtime owner, and real estate agent Anthony Cost both declined to answer questions for this story. The site is currently listed as for sale on the Hanna Commercial Real Estate website. Before walking away in November, Indianapolis-based Milhaus Development hoped to build a high-end apartment complex on the site. At a January 2018 public proposal meeting, community members in attendance and online overwhelmingly spoke out against the plan. Several people pointed out that the neighborhood was already facing a shortage of affordable and available housing. 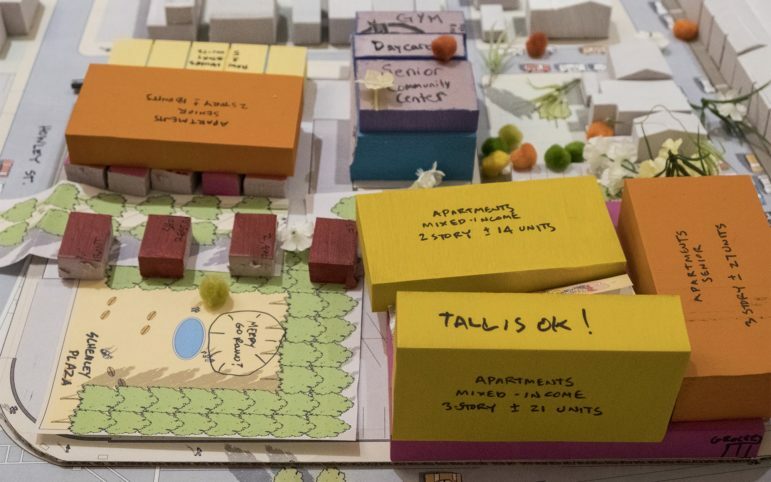 To proactively gain resident feedback, the community meetings in January and February gathered resident feedback using the “Place It!” technique developed by Los Angeles-based urban planner, community activist and artist James Rojas. The goal is to engage residents in urban planning using interactive, hands-on activities. At the February workshop, residents split into six groups and worked with a cardboard model of Bloomfield’s gateway and the ShurSave site. 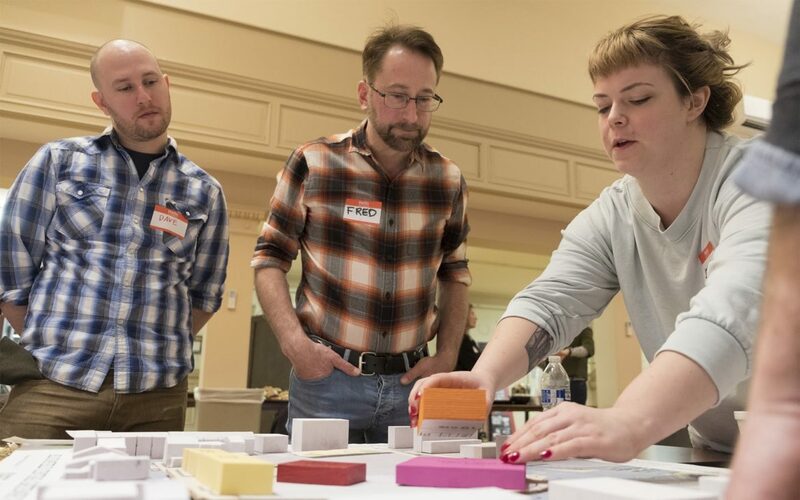 Each group had a series of colorful foam blocks in varying sizes that represented different kinds of buildings — offices, affordable rental complexes, grocery stores and community centers. Small plastic and cloth flowers represented touches of beautification. Pieces of paper printed with trees and gardens represented parks and outdoor spaces. Other pieces represented parking spots. With these materials, groups were instructed to build their ideal Bloomfield gateway, mixing residential, office and retail. Kathleen Matejko, 55, is concerned that redevelopment will leave the neighborhood without any grocery store. Residents also said they hope any new development wouldn’t stick out from the aesthetic of the neighborhood. Mik Pappas, an elected district judge for Wards 8, 10 and 11 who was born in Bloomfield, said the appearance of new development should respect and match the rest of neighborhood. “Anything we can do to pay homage to the history of the neighborhood through the design — apartments with balconies, things like that — would be a lot of added value,” Pappas said while presenting his group’s vision. But can hands-on brainstorming actually influence what happens at the site? Several residents voiced concern to their groups about if the final ideas presented April 10 would hold any weight in a private developer’s plan for the site. State Rep. Sara Innamorato, who represents Bloomfield, attended the February meeting and said she believes community members have more power than they think. Howell said resident feedback can impact decisions made by Pittsburgh’s Zoning Board of Adjustment and city Planning Commission. Based off the models created by participants at the February meeting, SFSP is creating recommendations to influence future development. Kline said the groups came up with ideas that were more diverse than he anticipated. The models included ideas ranging from high building density to sprawling green spaces, gardens and public parks. Participants included everything from affordable rental complexes and community spaces to office buildings and retail stores in their gateway models. Kline wrote in a March 18 email that SFSP’s April presentation will present two to three hypothetical scenarios for the site, rather than a single recommendation. The scenarios will describe key values residents prioritized, taking into account financial and legal limits to illustrate the feasibility of the models for developers, Kline wrote. Bloomfield resident Walt Haim, 25, is optimistic about the final outcome. He attended both meetings and believes the developer will consider the community input and build a positive example of redevelopment. It was one of the coldest February days when the furnace in Doren Dansby’s building broke. Soon after, the electricity in her Mount Oliver apartment started going offline for daylong spells.